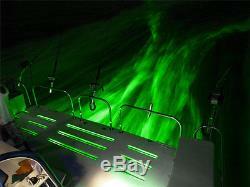 GREEN Trim Tab LED Light Bar Kit. A simple LED lighting kit that is very affordable, quality built, and mounts virtually anywhere you want. This kit is a pair of 12 volt waterproof light bars. This LED light kit features a very high output display, yet requires very little draw or power consumption from your batteries. Fully waterproof lights include 8' wire tail. Our kit also includes an inline 15 amp fuse for you to use in your wiring to a switch or into your existing navigation lights. As well as stainless mounting bolts and nuts. If screws are needed, please let us know with your order and we will include the stainless mounting screws. You can simply wire these into any close navigation light power source, run the wires to the battery, or add more wire and hook these into a switch on the dash for convience. It is a simple installation; 1 Negative & 1 Positive. Stranded copper core wire that is jacketed for added protection in the engine compartment. You can also get a little more creative and wire this into your existing navigation light wires or simply add a switch in an area that is convenient for you. So simple anyone can install! Easy way to add some safety for. Safety for loading and unloading at night. Great for attracting fish on your evening trips. Easily be seen out on the water. Easy way to help your sight when loading / unloading on lifts in the dark. We will drill these either way needed for you application. What a simple way to turn heads at the dock. You will be the talk of the marina or the boat ramp. We offer this Brand new light kit to you at a fraction of some of the industries kits costs. There is no need to worry about our kits. We build and test every single light in our dunk tank. This is an encapsulated unit that is totally waterproof and sealed. We perform in house testing to ensure you are getting a 100% waterproof light, and we initially power up every light kit to ensure that y ou do not get a D.
You are getting a top quality, 100% tested and fully functioning LED kit. MUST be paid for within 72 hours of sale ending. Thanks for looking and purchasing the complete LED tirm bar light kit! This is for a pair of the manufactured LED bars that are ready to screw on or bolt in and hook up. We offer this in White (Pic #9), Blue(#10) , and NEON Green! Also our P R O T O T Y P E (ask) See our picture and other listings. We make custom lengths and sizes for your need. Please Note which side you need drilled. We also carry the drainplug replacement underwater light kits for boats and jetskis. We also carry the drain plug LED for Seadoo and Yamaha jetboats. Check out my other items. All of our items and they are packed in the required packaging with reinforcement to ensure no one damages your item. We want to provide you with the absolute best service possible. Here is some of our great feedback from our drain plug lights. Check out all of our great reviews. Excellant ebayer a real pleasure to do business. NICE PRODUCT AS DESCRIBED A+++++++++++++++. A++++++ fast shipper awesome product. Great product, great communication, cares about customer A++++. CHECK MY OTHER AUCTIONS FOR MANY MORE MARINE ACCESORIES &SEADOO, YAMAHA, KAWASAKI, POLARIS PARTS AND TRAILERS.. If you feel that you have received any product or service that is less than 5 stars or described, notify us, and we will do our best to rectify the situation. The item "LED TRIM TAB Transom Light Bar GREEN 12V Waterproof Boat Kit Marine Underwater" is in sale since Thursday, May 03, 2012. This item is in the category "eBay Motors\Parts & Accessories\Boat Parts\Electrical & Lighting".